Students of the Bible who lack experience of the Hebrew language and culture, may struggle to reach a proper understanding of the Holy Scriptures. It follows that a knowledge of Hebrew is fundamental to a proper understanding, considering that the contemporary Christian Bible is a product of many translations and modifications. By Contrast, over a period of thousands of years, the original ancient Hebrew texts have been meticulously preserved to the present day. Modern versions of the Christian Bible are the end product of a series of translations. The first texts were translated from the original Hebrew to Aramaic, then from Aramaic to Greek, Greek to Latin and finally Latin to English. The full Bible has been translated into over 450 languages, parts of it into more than 2,000 languages. The Torah (Hebrew: instruction, teaching) is a central concept in the Jewish tradition — click to enlarge. One of the earliest Bibles, known as the Great Bible of 1538, was so called because of it’s large size and weight. It was the first full translation in English and was authorized by King Henry VIII of England. The Christian Bible was translated many more times in an effort to make the text more ‘user friendly’, in the modern era. English text modifications include, inter alia, the 1769 edition of the King James Version, Revised Standard Version, New American Standard, New English Bible, New International Version and the New World Translation. 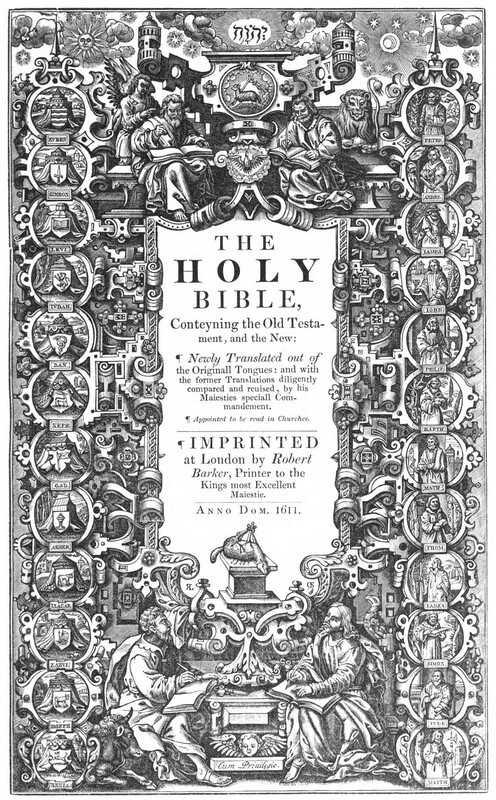 The King James Bible of 1611, standing head and shoulders above the rest, is held by most Biblical scholars to be the most authoritative and accurate English translation. The obvious question that springs to mind is this: after so many translations and modifications, is it possible for anyone who cannot read Greek or Hebrew to know what the Bible really says? 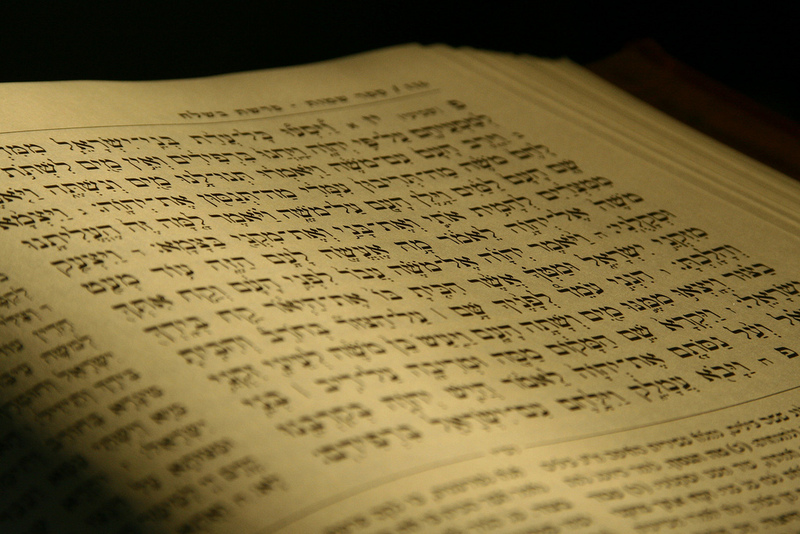 There are many Hebrew words in the Torah that present difficulties with translation. For example, the word dâbhâr (Hebrew for ‘word’) occurs over 1400 times in the Torah and is translated by 85 different English words in the KJV Bible. It’s root verb, dâbhar, occurs over 1100 times and required 45 different English words in translation. Jesus was born a Jew. At age 12, we find him sitting in the Temple discussing the finer points of the Torah with the religious leaders of his day (Luke 2:39-52) and at the tender age of 15 He delivered His first sermon at the synagogue, reading from the Torah. Sermons were undoubtedly delivered in Hebrew which was regarded as Lashon Ha-Kodesh, the sacred language of the Jewish people. The words of the Torah were, and are, sacrosanct. 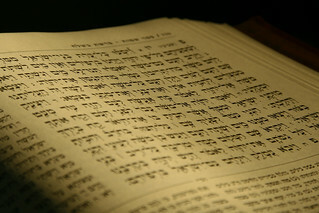 Hebrew is therefore the language of study and is preserved in the words of the Torah and various commentaries. Therefore it’s abundantly clear that the origins of the Christian Bible are firmly linked to the dawn of ancient Judaism in the 2nd millennium BCE. Jewish tradition holds that in 1800 BCE the principal founder of the Jewish faith, the patriarch Abraham was born to Terach, an idol merchant. 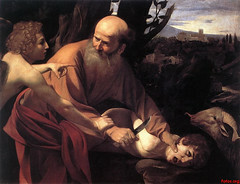 The Sacrifice of Isaac by the Italian master Caravaggio (1571–1610) depicts Abraham attempting to sacrifice his son Isaac, as commanded by God — click to enlarge. Abram, as he was known then, questioned his father’s belief in idols from early childhood. In time he came to believe that a single Creator brought the entire universe into existence. Abram began to teach this belief to others and in this way the religion of Judaism came into being 4000 years ago. 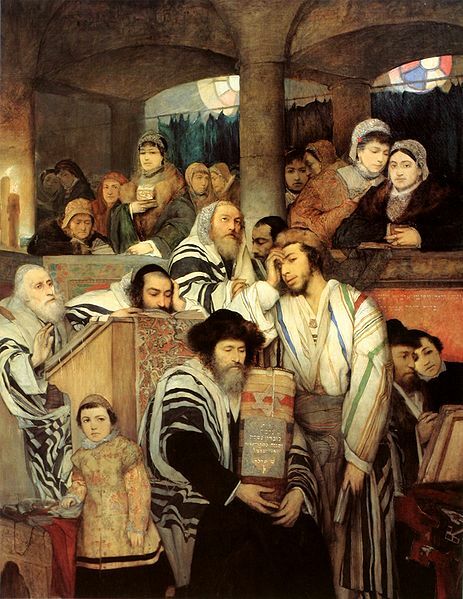 The Torah is the foundational narrative of the Jewish people. It is their covenant with their God and it involves a way of life, called halakha, which is embodied in a myriad religious obligations and civil laws. For example, while the Ten Commandments of the Old Testament is common to the Jewish, Christian and Muslim faiths, these commandments are ‘headings’ or ‘sections’ that expand to a total of 613 commandments or Mitzvot that must be diligently observed by adherents of the Jewish faith. 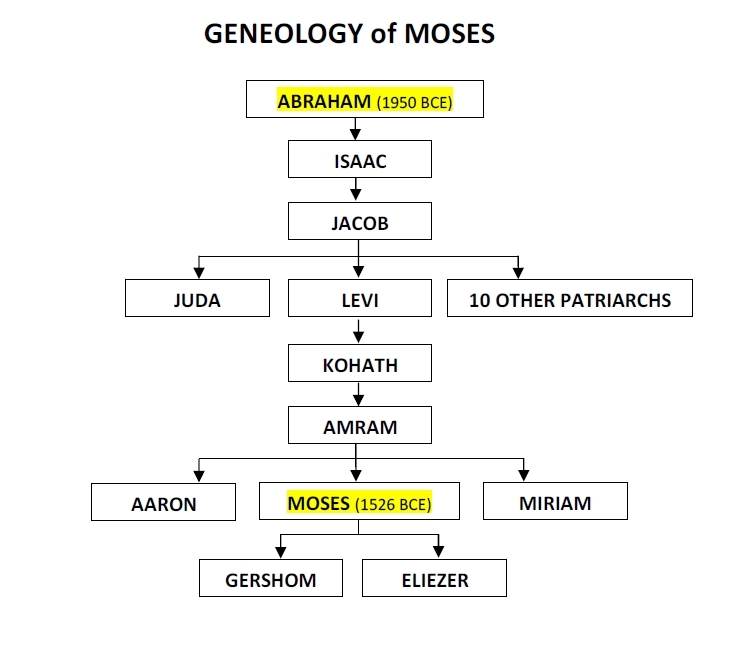 The genealogy of Moses — click to enlarge. 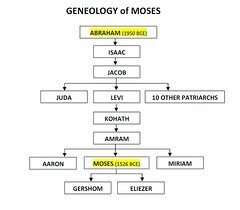 According to tradition, Moses is the author of Exodus. It is believed Moses wrote Exodus and the rest of the Pentateuch during the exodus from Egypt commencing in 1462 BCE. The Hebrew Bible, or Tanakh, contains twenty-four books divided into three parts; the five books of the Torah (“teaching” or “law”), the Nevi’im (“prophets”), and the Ketuvim (“writings”). In it’s original form the Tanakh was recorded in ancient Hebrew, “the Divine Language” Ktav Ivri, also referred to as the Paleo-Hebrew alphabet. The script was reserved for the transmission of religious texts and it closely resembles ancient Phoenician. Later this changed to the square script called Ktav Ashurit that has been preserved over the centuries by the soferim or scribes. 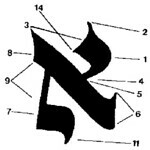 Aleph the first letter of the Hebrew alphabet — click to enlarge. A scribe or sofer is a specially trained individual who is devout and knowledgeable in the laws governing the proper writing and assembling of a scroll. The work is a holy task carried out according to precise, meticulous rules which govern the method of constructing the letters, the materials used and the entire process of manufacturing a scroll. In the New Testament period the scribes were learned teachers and authoritative leaders, who were drawn from the priests and Levites, as well as the common people. Hebrew of the Torah is the essential ‘aether’ of the Christian Bible. It follows that a knowledge of Hebrew is fundamental to a proper understanding of the Holy Scriptures. Sources: Featured Image: Lavi Perchik; King James Bible Online; Bible translations; Bible.org; The Voice: Hebrew and Aramaic Terms; Biblical Hebrew: An Introduction to Hebrew; The Scribes; A List of the 613 Mitzvot; Godstenlaws.com; Biblegateway.com; Chabad.org: Mitzvahs & Traditions; Did Jesus Speak Hebrew? ; WikiMedia Commons: Maurycy Gottlieb; Ohio State University Library. Jewish Passover and Christian Easter: What Do They Have In Common?